"We are delighted our program has funded hundreds of artists working in top visual arts centers. To support the highest level of artistic vision, creativity and free expression is most satisfying. Finally, knowing our investment has inspired other philanthropists to fund the arts -- and the work of artists -- is indeed rewarding." "I am thrilled that our philanthropy allows artists from around the world to come to the United States and work in both large and small institutions. Also, the artists we support in turn generously share their talents with the communities they visit, which is very important to us"
Susan Bay-Nimoy and Leonard Nimoy are members of the West Coast Chairmen's Council. 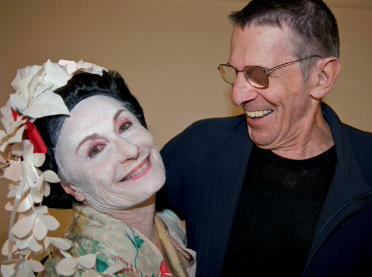 "Also in attendance [at the EveryChild Foundation Gala 2010] was Leonard Nimoy, who accompanied his wife, actress Susan Bay." Mr. Nimoy narrates a video for the Everychild Foundation that his wife Susan supports. An organizstion to bring "together people who share a passion for contemporary performing and visual arts, and who are committed to ensuring the financial health of this artistic endeavor." The REDCAT Circle is the patron group at the Roy and Edna Disney/CalArts Theater (REDCAT). It brings together people who share a passion for contemporary performing and visual arts, and who are committed to ensuring the financial health of this artistic endeavor. Annual gifts made through the REDCAT Circle support the dynamic artists we present and help maintain our state-of-the-art facility in downtown Los Angeles. All REDCAT Circle members are invited to attend REDCAT Salons throughout the year. REDCAT Salons are often held at private residences, providing members the opportunity to meet and mingle with performing and visual artists, and to engage in lively discussions with fellow patrons, the REDCAT Council, CalArts trustees and community leaders. Other listed celebrities included Mel Gibson, who came fourth with a donation of $6.5m, Leonardo DiCaprio, thirteenth, who gave $1.5m, and Leonard and Susan Nimoy, at number 29, who gave $510,000 (£308,000). The minimum donation required to be on the list was £500,000. At the USA Simon Fellow Celebtation 2009. The United State Artists goal is "to invest in America's finest artists and illuminate the value of artists to society." Terms: Includes: a private tour of Griffith Observatory in Los Angeles, California. Valid for two people, for one year, based on a mutually agreeable time. At dusk on October 31, Halloween night, SMMoA and hosts Susan and Leonard Nimoy welcomed hundreds of fantastically-attired party-goers to The Halla Gala. SMMoA Trustees, donors, artists and featured designers, dressed as their secret selves, enjoyed a delectable feast in a magical setting and were treated to complimentary photographs in a surrealist photobooth. Costume contest winners Miriam Wosk, Olga Garay and Kerry English (i.e., the two Fridas and Trotsky) walked away with the grand prize—a private photo portrait session by Leonard Nimoy, who generously took photographs that evening of high-level package buyers. The Halla Gala raised over $400,000, thanks in part to a generous matching grant from Chora* - a direct charitable activity of The Annenberg Foundation. TrekMovie.com has a photo of Jim Parsons holding the autographed napkin. 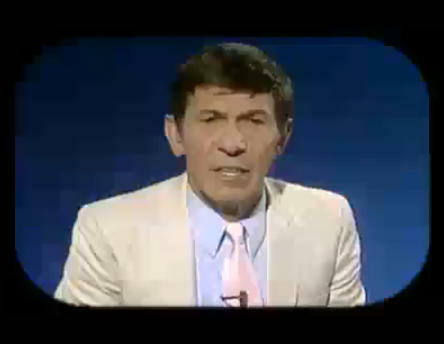 Despite people's best efforts, including those of William Shatner in 2010, the show didn't manage to entice Mr. Nimoy into doing a guest appearance. "I can get him" when asked if he can convince Leonard Nimoy to appear on The Big Bang Theory (which airs right before Shatner’s $#*! My Dad Says) on CBS on Thursdays. 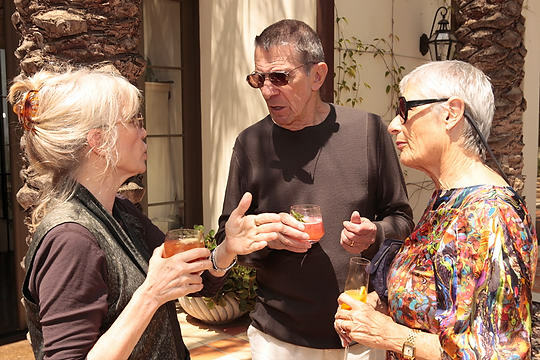 Sip cocktails with Leonard Nimoy and visit his home and art collection. Dine on the Terrace of the Bel-Air Hotel and discuss your favorite objects of art at the Getty Center and the new Eli Broad Wing at the Los Angeles County Museum. Enjoy the exotic food selections at Mr. Chow’s while sharing the restaurant with Jay Leno. All of these fascinating experiences were enjoyed by NOMA’s Circle members on their recent trip to Los Angeles. Go to page 18 of Arts Quarterly (pdf file) for the article with photo. Nimoy’s contributions made over $14,000 of the total $40,000 raised during the auction, with proceeds going to the American Cancer Society and the Nimoy Foundation, an initiative that gives grants to artists-in-residence programs in museums and galleries around the US." Seefor more. He contributed some special one-of-a-kind items such as a plaque from NASA thanking him "for inspiring a generation of scientists and explorers." That sold for $3100. Another plaque presented to him by Paramount on the occasion of Star Trek's 25th anniversary in 1991 went for $1500. 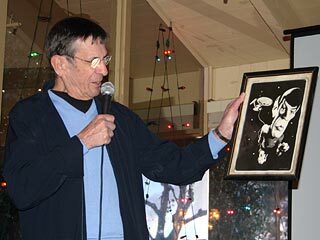 An original piece of artwork — a caricature of Nimoy tethered to the Enterprise — created by his hometown newspaper, the Boston Globe, to accompany an interview with him in the late '60s went to a lucky bidder for $1700. Nimoy brought several items signed by both himself and William Shatner, such as books and rare photos. One was a copy of Nimoy's book "I Am Spock," and on the inside cover Shatner inscribed: "I thought he wrote 'I Am Not Spock' — wish he'd make up his mind!" In another, a collection of Nimoy's poetry titled "A Lifetime of Love," Shatner was less glib, writing, "And I've loved him for a lifetime - Wm. Shatner." Those books brought in about $600 each. More photos of the event can be found at the Lightspeed Fine Art website. Leonard Nimoy and his wife beamed up for a visit to the contemporary arts center at Ohio State University, which will receive $40,000 from their charitable foundation. The gift to the Wexner Center for the Arts is the largest share of the $425,000 being distributed to 21 U.S. art organizations. The actor, best known for his role as Spock on "Star Trek," is also a movie director and art photographer. The Nimoy Foundation, founded in 2003, has given the Wexner Center $90,000 in grants for artist residencies. Nimoy, 75, and his wife, Susan Bay-Nimoy, 63, who serves as vice chairwoman of the Museum of Contemporary Art in Los Angeles, toured the center Tuesday. 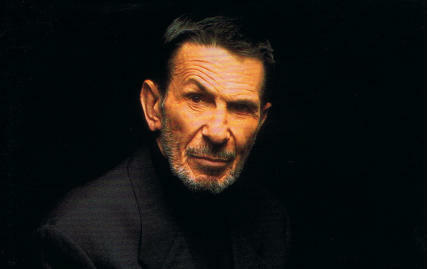 In an interview with The Columbus Dispatch, Nimoy said contemporary art leads to the exploration and expansion of one's mind. "And to go to that rather than run away from it is where the excitement is - to explore it, ask questions about it, research it, talk to people about it," he said. Nimoy, who enjoys black- and-white photography, said it allows him to create an object. "I love the idea that I can get up in the morning with an idea and by the end of the day have something that I can give to you, hang on the wall or give to a gallery," he said. 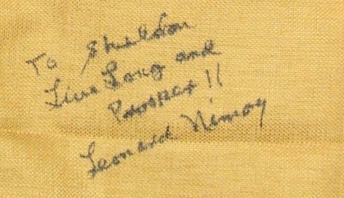 Leonard and Susan Nimoy are listed as benefactors for the organizastion. They visited in 2005. Kulture Klub Collaborative is an independent nonprofit arts organization that brings together artists and homeless teens at YouthLink/Project OffStreets, a crisis drop-in center- located in downtown Minneapolis. Through workshops, open mics, cultural presentations, and "art views," homeless teens develop their creative expression, receive exposure to artistic excellence, and enter into a group of peers, supportive adults, and diverse social communities. The 80th birthday of actor, singer, Soviet Jewry champion and Yiddish language true believer Theodore Bikel was marked by more than 1,300 well-wishers with the June 6 concert, "Theo! The First 80 Years," at Brentwood's Wadsworth Theater. The fluid 90-minute show was directed by Milken Community High School middle school drama director Rachel Leah Cohen, who expertly included collages of Bikel from his 2,000 stage performances as Tevye in "Fiddler on the Roof," plus memorable film roles in, "My Fair Lady," "The African Queen" and his Academy Award-nominated Southern sheriff performance in "The Defiant Ones." With actors Leonard Nimoy, Larry Miller and Mare Winningham, plus the Stephen S. Wise Temple's elementary school chorus, the $50-$350 tickets filled the Wadsworth seats as "Theo!" raised funds for Jerusalem's Shaare Zedek Medical Center. "The Nimoys were the honorees at the MOCA's gala opening of a retrospective exhibition of British artist Lucian Freud's work Friday night. According to the Los Angeles Times, the memorable event boasted fan-dancing women in python costumes and an impressive multimedia display. Painter David Hockney, who served as one of Freud's portrait subjects, played host. The Nimoys' arrival was greeted by "a small storm of flashes," according to the Times, as the pair was honored for their commitment to the museum and for contributing $1 million to a new fund for emerging artists." It took awhile, but William Shatner has finally convinced Leonard Nimoy to get on a horse and join him for his annual Hollywood Charity Horse Show (HCHS), which is convening for the 13th time this month. The HCHS is being held at the Los Angeles Equestrian Center from April 24-27, with the main attractions taking place Saturday the 26th. The event, like in past years, is a fundraiser for two charities: Ahead With Horses, a therapeutic riding program for severely handicapped children; and LA's BEST, an acclaimed after-school enrichment program in the Los Angeles area. Nimoy will participate in the 'celebrity team penning' competition, which tests participants' ability to round up cattle or other animals. Teams in the contest will be made up of three riders, one celebrity (besides Nimoy and Shatner, several radio personalities and other actors will take part), one professional rider, and one amateur who gains the privilege with a $500 charitable donation. The Art of the Palate fundraising dinners will occur all over Los Angeles on Sept. 26 -28 and over five nights in October. This year's dinners will focus will be on architecture. Among the featured homes: The Bilgers, Joyce and Saul Brandman, Linda and Maynard Brittan with special guest Frank Ghery, The Corwins, The Davidsons, The Beckmens, The Greenbergs, Michael Bay, Annie Kelly and Tim Streetporter with Diane Keaton, The Lainers, Mark Selwyn with special guest Leonard Nimoy and The Simons. Young Advocates is a young professionals organization focused on developing awareness and interest in the Boys & Girls Clubs serving Wake County. In 2002, Young Advocates began its mission to bring awareness for the Boys & Girls Clubs through fundraising and social events. Eight years later, YA has become a premier young professionals organization hosting large scale events, corporate socials, and Club-based events to support the mission and vision of the Boys & Girls Clubs. This year, YA has set the bar high with creative, innovative ideas to bring more awareness to the Triangle about the Boys & Girls Clubs and Young Advocates. The Boys & Girls Clubs is a place, an actual neighborhood-based building, designed solely for youth development purposes. The mission of the Boys & Girls Clubs is to enable all young people, especially those who need us most, to realize their full potential as productive, caring, responsible citizens. The Boys & Girls Clubs are open every day after school and on Saturdays; whenever kids have free time and need positive, productive outlets. Research has shown that the most critical time in a child’s life is between 3 and 8 p.m. – this is where the Boys & Girls Clubs fill the void with structured, enriching, and exciting after school programs. Since 1967, volunteers have made it possible for the Boys & Girls Clubs to serve more than 4,200 youth 6 to 18 years of age in seven Clubs and a Summer Day Camp in Wake County. The Boys & Girls Clubs is a nonprofit privately funded 501(c)3 organization and depends on investments and volunteers to accomplish its mission. The American Friends of the Israel Philharmonic Orchestra (AFIPO)'s Los Angeles benefit raised $300,000, via a benefit dinner/recital held at the Beverly Hills home of producer Irwin Winkler ("Goodfellas," the "Rocky" series) and his wife, Margo. Pianist Lang Lang, 20, performed the private recital. For an encore, he was joined by his father, Er-hu master Guo-Ren Lang. More than 70 guests caught the exclusive show, including Donna and Lalo Schifrin, Edyeand Eli Broad, Susan Bay and Leonard Nimoy, Joyce Eisenberg and Mel Keefer and Annette and Peter O'Malley. When we gave to the Griffith Observatory, I read a little blurb in the L.A. Times that said the observatory was reaching completion on a $63 million renovation and expansion. They had raised $43 million under our radar screen. After we gave our gift for the Leonard Nimoy Event Horizon Theater, their phones rang off the hook with all these "Star Trek" fans. They gave money like mad. By observing the sky and pondering our place in the universe, people gain a new perspective on their daily lives," said Leonard Nimoy. "Griffith Observatory gives its visitors that opportunity. It is a Los Angeles icon, one which we need to ensure will be here for generations to come." "Like so many people in this area, we recognize what a powerful resource the Observatory is for the community," added Susan Bay-Nimoy. "When we learned of the plans for renovation and expansion, Leonard and I agreed that we wanted to make a substantial commitment, both personally and financially, to the project. 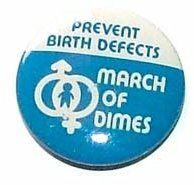 I hope that our participation will encourage others to become involved. To read the press release from 2001 go here. STARTREK.com reported from he gala re-opening event. A reprint of the article is here. 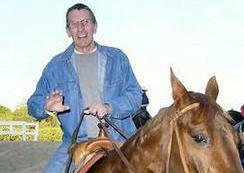 And here is a Q&A with Leonard Nimoy on the subject. 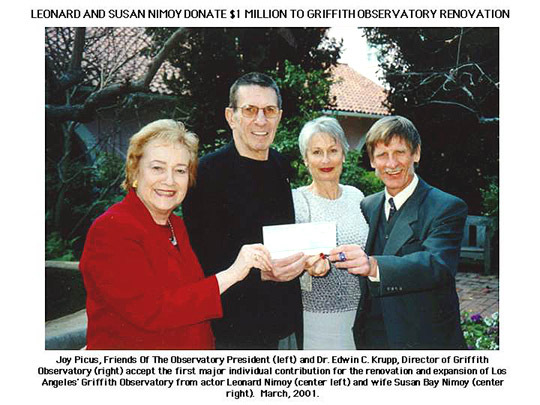 Feature about the Griffith Observatory and Mr. Nimoy's contribution to it's remodeling. The article runs from page 14 to 19. "We were putting our crew together, meanwhile a Chabad house burned down and three men were killed in the fire," Jeff Cutler said. "Rabbi Shlomo Cunin called my husband and asked if we could put something together across the street in a tent. We put together a one-act play, Arthur Hiller directed it, Ed Asner and Leonard Nimoy were in it, and it made a million dollars. We were rehearsing it during the day, and Rabbi Cunin asked us 'Have you ever produced a telethon?' We said 'no,' and he said, 'Well, you're going to!'" In six weeks we put together a four-hour telethon with Jan Murray as the host, and we made another million dollars. It was a very successful, amazing time, and we made it an annual show." Love. It Comes in All Colors was a National Urban Coalition television commercial and print advertisement from 1970. It was part of a campaign to promote racial harmony. It featured political activists, and celebrities from sports, show business, government, and business. In the article below we learn that three hours were planned to film the bit, but since all were highly motivated it got done in little over an hour. For better resolution go here to page 44 and 45 (or here for a transcript of the text). There is another one with a color photo from TV Guide here.